The immediate response to events such as disasters is stress, about which we have prepared information for the public, for health care professionals, and for public safety workers. This fact sheet is an overview of stress-related disaster as it relates to health care and mental health care. Stress is an elevation in a person's state of arousal or readiness, caused by some stimulus or demand. As stress arousal increases, health and performance actually improve. Within manageable levels, stress can help sharpen our attention and mobilize our bodies to cope with threatening situations. 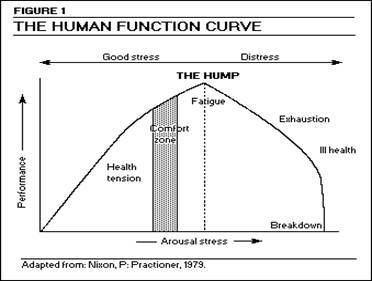 As the following graph illustrates, “optimal” stress involving functional amounts of arousal contributes to effective task performance, including response to disaster. But beyond that optimal level there is deterioration of health and performance begins to lessen, so it is important to manage stress in order to keep it in the “good” range. Stress is mediated by appraisal, a cognitive “story” that we tell ourselves about the disaster circumstances and our response to them: Have we had this experience before? If so, how did we respond? What was the outcome? Can we cope with the situation now? If there's doubt as to any of these questions, the stress response elevates. Here are some common stress reactions in response to disasters, experienced to varying degrees by everyone involved with them, and which you will experience as well. *Seek medical attention immediately if you experience chest pain, difficulty breathing, severe pain, or symptoms of shock (shallow breathing, rapid or weak pulse, nausea, shivering, pale and moist skin, mental confusion, and dilated pupils). **Seek mental health support if your symptoms or distress continue for several weeks or interfere with your daily activities. Remember that stress response, grieving, coping, and resiliency are all processes, not events, and therefore take place along a more or less predictable, but always dynamic, timetable. Practice self-care and coping for yourself. Intrusions, such as flashbacks or nightmares, where the traumatic event is re-experienced. Avoidance, where the person tries to reduce exposure to people or things that might bring on their intrusive symptoms. Hyperarousal, meaning physiologic signs of increased arousal, such as hypervigilance or increased startle response. Although the effects of PTSD are serious and difficult to deal with, it can be treated by a variety of forms of psychotherapy and medication. This is the homepage for the National Center for Posttraumatic Stress Disorder. It has fact sheets and resources covering all aspects of PTSD, including information geared specifically toward mental health care providers. This is part of SAMHSA’s “Guide to Managing Stress in Crisis Response Professions”. It lists, explains, and differentiates between common and extreme responses to stress. This is a PowerPoint presentation on the mental health consequences following the World Trade Center disaster. It outlines the immediate and long term responses to the event and the therapeutic interventions utilized as well as a summary of their effectiveness. This FEMA fact sheet provides hints for recognizing stress and tips for relieving stress. This disaster resources website, by the University of Illinois, has information on preparing for disasters and coping in their aftermath.